Our dedicated staff is Happy to Help. Less than 24 hour response time. 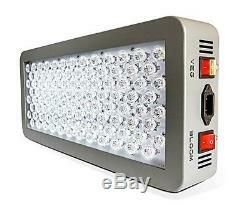 Advanced Platinum Series P300 300w 12-band LED Grow Light - DUAL VEG/FLOWER. Platinum LED lights have the HIGHEST PAR/LUMEN OUTPUT PER WATT of any LED grow light! 2x-3x the intensity of any other lights! SUPERIOR 12-band full spectrum from the depths of UV to the heights of IR - The most complete and efficient spectral output available. Selectable VEG/FLOWER switches with 2x high speed whisper quiet fans plus ALL NEW upgraded aluminum cooling heat sinks. 400w HPS replacement with 4.5ft x 3.8ft coverage at 18 height - PERFECT for compact applications or using multiple units for even coverage. Welcome to the next generation of PlatinumLED Grow Lights THE MOST POWERFUL LED GROW LIGHTS available on the market today! Featuring the highest PAR per watt of any other LED grow light along with the most complete 12-band spectrum available, our lights ensure maximum yield with minimum power usage and heat. PAR & spectral output equal a quality, powerful LED grow light not wattage draw! Our ultra-powerful, efficient lights far outperform the cheaper made units that while consuming excess power, emit a fraction of the PAR. Higher yields, lower growing temperatures, better efficiency. The P300 effectively replaces a conventional 400w HPS grow light while only consuming 180 watts of actual power, while giving your plants 100% USABLE light that is perfectly tuned to create maximum photosynthetic response. The secret to the PlatinumLED success is combining an optimal blend of 12 different bands of complete light spectrum all the way from the depths of UV to the upper IR - giving your plants EXACTLY the finely tuned spectrum that they need. Max Coverage at 18 Height 4.5'x3.8. Core Coverage at 18 Height 3'x2. LED Quantity 100x3w US MADE LEDS. Secondary LED Focusing Lens 90. Power Draw 93w Veg / 180w Bloom. We offer the best prices around on high quality products. Our E-store includes media such as books, movies, music and games while offering electronics, toys, sporting apparel, clothing, tools, general home, garden items and more. We are always working hard to ensure your package arrives as soon as possible. We do not accept P.
Please provide a physical address. We try over very best to make sure every customer is completely satisfied. If there's a problem, message us! We're happy to help. All electronics we sell are designed to run on 110-120V unless stated otherwise. SUBSCRIBE OUR NEWSLETTER JOIN NOW. Our dedicated staff is happy to help Less than 24 hour response time. The item "Advanced Platinum Series P300 300w 12-band LED Grow Light DUAL VEG/FLOWER" is in sale since Sunday, April 10, 2016. This item is in the category "Home & Garden\Yard, Garden & Outdoor Living\Gardening Supplies\Hydroponics & Seed Starting\Grow Light Kits". The seller is "lyolawire" and is located in "Columbia, MO, USA". This item can be shipped to United States, Canada, United Kingdom, Denmark, Romania, Slovakia, Bulgaria, Czech republic, Finland, Hungary, Latvia, Lithuania, Malta, Estonia, Australia, Greece, Portugal, Cyprus, Slovenia, Japan, China, Sweden, South Korea, Indonesia, Taiwan, South africa, Thailand, Belgium, France, Hong Kong, Ireland, Netherlands, Poland, Spain, Italy, Germany, Austria, Russian federation, Israel, Mexico, New Zealand, Philippines, Singapore, Switzerland, Norway, Saudi arabia, Ukraine, United arab emirates, Qatar, Kuwait, Bahrain, Croatia, Malaysia, Brazil, Chile, Colombia, Costa rica, Panama, Trinidad and tobago, Guatemala, Honduras, Jamaica.